There is a saying 'Catches Win Matches' but yesterday Pakistan invented new saying 'Drop Catches Lose Matches'. As many as 7 catches dropped by Pakistani fielders out of these 7, Sachin Tendulkar alone dropped 5 times. No wonder after dropping so many catches you can't expect to win. Poor Kamran Akmal's woes with the gloves continued in this match as well, he dropped two catches and after dropping so many catches in past six months, his favourite tagline must be 'Can I drop you somewhere'. It was poor fielding effort by Pakistan which haunted them in this match. But I must appreciate the way Pakistan made a comeback after great onslaught from Sehwag. Even after dropping so many catches Pakistan pulled things back nicely and restricted India to the par score of 260 but I must credit pitch also alongwith Pakistani bowling, which had in it for the bowlers. Wahab Riaz was the stand out bowler for the Pakistan who picked 5 crucial Indian wickets and jolted famed Indian batting line-up. It was also a very brave decision from Shahid Afridi to include Riaz ahead of experienced Shoaib Akhtar and Riaz lived upto his team's expectation as he bowled dream spell of his life in a situation where pressure was immense on the players of both the teams. Umar Gul was the big disappointment yesterday for Pakistan as he never recovered from Sehwag's initial onslaught. It was poor fielding, catching and thoughtless batting that played important role in Pakistan's defeat. In batting Pakistan was 102 for 2 at one stage and it looked like Pakistan will register the win here but poor shot selection by Hafeez tilted the match in India's favour and after that thoughtless batting from Misbah Ul Haq and Younis Khan added the pressure on Pakistani batting and in the end Pakistan crumbled like nine-pins. Umar Akmal showed some sign of aggression but it was too late for Pakistan. It was such a tense situation that Afridi forget about the powerplay also while he was batting. I must appreciate Dhoni's captaincy in last few matches. I think he got his thinking cap own and now looks to attack the opposition batsmen and that gives him the results in his favour. In last 3 matches he has really worked out the strategy which I mentioned in earlier posts. Now he looks in control of the situation. But Dhoni's batting has not clicked yet and that is bit of worry for the Indian camp. Sachin Tendulkar played very scratchy but important innings yesterday for India. He was lucky that he got so many chances from Pakistani fielders and UDRS also came to his rescue. I think Pakistani fielder were in too much awe of Tendulkar's batting that they kept on dropping him. It was unfortunate that Sachin wouldn't complete his 100th century but nonetheless it was priceless innings. I think Sehwag and Raina also played important role and those 38 and 37 runs from Sehwag and Raina proved crucial in the end. With the innings of 85 Sachin became the highest run-getter in the tournament and he is one player who is now have the distinction of featuring in India's 5 World Cup victories over Pakistan. It was heartening to see Indian bowling coming good when it mattered the most. When match started it looked like Dhoni mis-read the pitch and dropped Ashwin he admitted also in post match conference that he mis-read the pitch but he was lucky in the sense that Ashish Nehra came good when it mattered. Nehra was economical and picked up wickets as well on a pitch which was not conducive for the fast bowlers. I must mention that Nehra was pick of the fielder yesterday. he fielded very well and raised his game to another level. I think Indian team put in great effort yesterday and everybody contributed in the success of the team. Now India team is in finals of World Cup and they made it there 3rd time. They will play Lankans on Saturday in Sachin's city. I think if Indian team continue with their current from and momentum they stands with great chance to win title and that will be a great tribute to our 'GOD' Sachin. Sachin was also adjudged 'Man of the Match' for his gritty innings in this match. Once again Lankans proved that Premdasa is the fort and they are kings of Premdasa. Kiwis created little panic in Lankan batting but in the end it was brilliance Mathews which helped Lankans to seal the berth for the finals in Mumbai. It was enthralling contest where fortunes fluctuated from one side to another in the end team which held its nerves end with victory under their belt. Defending a mediocre total after a spirited batting effort had unravelled in a clatter of late wickets, New Zealand's lust for a scrap kicked in with a vengeance just when it seemed the match was finally out of their reach. With Tillakaratne Dilshan and Kumar Sangakkara entrenched in a game-breaking partnership of 120. But then Dilshan, cruising on and seemingly destined for his second hundred in consecutive matches, slapped loosely at Tim Southee and picked out Jesse Ryder at point, whose second catch of the innings was a far less breathtaking affair than his earlier one-handed pluck off Sri Lanka's pace-setter, Upul Tharanga. Three balls later, the new man Mahela Jayawardene was beaten in flight by a beautiful dipping delivery from Daniel VettoriSangakkara's habitually cool head deserted him, as he attempted to steer the lively Andy McKay over the keeper for four, but ended up dollying a simple chance to Scott Styris at third man. Sri Lanka had lost three wickets for eight runs in 22 deliveries, and just as had been the case in the throttling of South Africa, New Zealand's bowlers ramped up the aggro while maintaining supremely disciplined lines and lengths. On the same worn wicket that had been used for the England quarter-final, runs suddenly became excruciatingly hard to come by as Sri Lanka's untested middle order was fully exposed to the limelight.Samaraweera, however, had the experience to see his team home. A short ball from Ryder was fetched over midwicket for four, before a wild throw from Oram gifted him another four as the ball sailed over the keeper's head. Another error lopped five more precious runs off the total as a McKay wide slipped through the keeper's grasp, and though McKay responded with a beauty to Angelo Mathews that was sent to be reviewed for caught-behind, the lack of Hot Spot meant there was no evidence available to reverse the on-field decision. And with a smoking six off Southee in the next over, the game was finally relieved of its tension - even though it took two winning shots to seal it, after Mathew's initial carve through the covers was called a dead-ball due to a firework exploding right at the moment of delivery. Instead, Samaraweera nudged through third man to wrap up the game with 13 balls to spare. 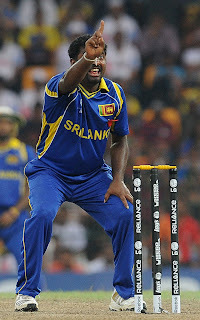 Such a nerve-jangling finale could not have seemed further from the agenda while Sri Lanka's innings was in full flow. From the moment Tharanga launched his third ball, from Nathan McCullum, straight down the ground for six, Sri Lanka were always ahead of the asking-rate. His departure did change the tempo of the Sri Lankan innings, but neither Dilshan nor Sangakkara had any reason to rush towards a modest victory target. Sangakkara had an early let-off when he edged Oram at a catchable height through the vacant slip cordon, while Dilshan - who had been so combative against England - took 28 deliveries to score the second boundary of his innings, and his 50th of the World Cup to date. But he went on to pass 400 runs for the tournament, en route to overtaking Jonathan Trott as the leading run-scorer, and as Sangakkara finally began to nail his trademark cover-drives, New Zealand looked to have run out of ideas. In hindsight, the Kiwis will look back on the closing stages of their own innings with regret, for a late collapse undermined much of the good work they had put into the early part of their innings. The bed-rock was provided by Scott Styris, a centurion against Sri Lanka in the 2007 World Cup, who played responsible innings. But when he was extracted lbw by the final delivery that Muttiah Muralitharan will ever bowl on home soil, Sri Lanka responded euphorically to scythe through the tail and leave seven precious deliveries unused. Whether a 250 target would have made any difference will remain a matter for conjecture. Though they fared better than any other team in the tournament so far in taking 41 runs off Sri Lanka's bowlers in the batting Powerplay, they were ultimately undone by the depth and variety of their attack, with Lasith Malinga's yorkers scalping three key wickets at critical moments. Too many of New Zealand's batsmen made starts without going on. Martin Guptill flicked Malinga's fifth delivery through midwicket, only for Malinga to york him superbly when he returned for his second spell, while Brendon McCullum slog-swept Rangana Herath for six, only to be bowled for 13 playing the exact same stroke. Taylor, whose ferocious hitting could have been so valuable at the death, launched a Mendis long-hop straight to deep midwicket just when he looked ready to build his innings further.But as Vettori takes his leave of the New Zealand captaincy, he can reflect on yet another campaign in which his team rose to the challenge of the big event in precisely the manner that too many of their supposed betters - namely England and South Africa - consistently fail to do. Sangakkara and his men, meanwhile, march on to their second final in consecutive World Cups, where Muralitharan - his broken body notwithstanding - will attempt to complete his career on the highest high imaginable.